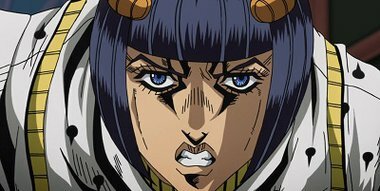 Because of their own wills and their sense of justice, Bucciarati and the others end up betraying the organization. Trish also wants to find out who her father truly is, so she tells the others that her mother met her father in Sardinia. They all decide to have a meal in Venice before they leave and Narancia is suddenly attacked by a Stand. The boss's own personal elite guard was now on the move.